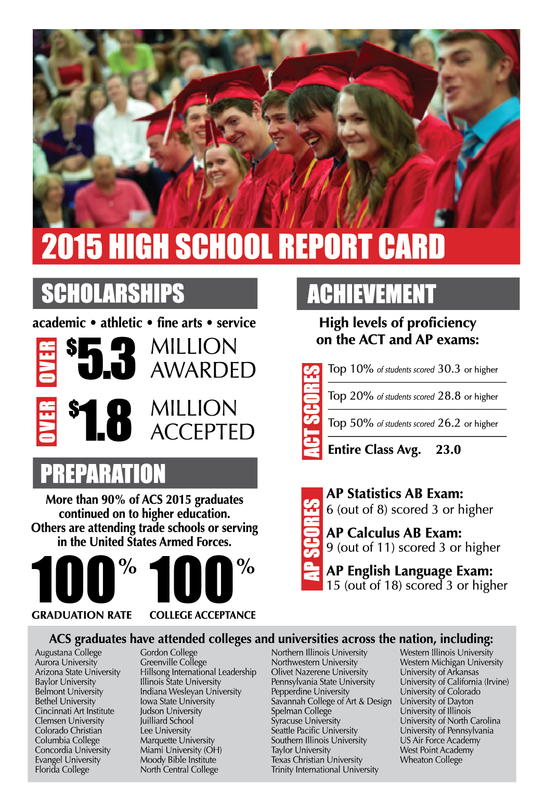 Click here to see the updated ACS Report Card! Click here for the full 2018-2019 ACS High School Profile. OUR MISSION To work with families in bringing their children to a personal relationship with Jesus Christ, educating them from a Christian worldview, and preparing them for a life of service to Christ and their world. THE SCHOOL Aurora Christian School is a college preparatory, non-denominational Christian school, started in 1975 by concerned parents and Christian citizens looking to provide a solid education based on God’s principles. Aurora Christian School’s enrollment is 412 students grades 6-12. Aurora Christian School admits students of any gender, race, national or ethnic origin and does not discriminate on these bases in its educational policies, admissions procedures, scholarship awards, athletic and other school administered programs. The GPA is determined by adding the equivalent GPA quality points and dividing the total by the number of semester credits. ACSI (Association of Christian Schools International) “ACSI strives to enable and equip Christian educators and schools worldwide to effectively educate children and young people with the mind of Christ." NCA (North Central Association). Through accreditation and related services, NCA CASI continuously improves the quality of education and challenges education entities to prepare each and every learner for success. IHSA (Ilinois High School Association). The IHSA serves member schools by providing leadership for equitable participation in interscholastic athletics and activities that enrich the educational experience.